This past week has been a flurry of activity for me. Not a day went by when I didn’t have something to do in the evening. I’m a social creature by nature. I enjoy seeing my friends and attending events and everything in between, but when you are trying to lose weight it makes it difficult to maintain. This week ended surprisingly but we’ll get to that in a while. Last week recorded a single pound lost which, to me, isn’t a good week. It’s better than losing none or gaining weight, of course, but I know I can do better. I also know that I say that every week. Just like most everything else in life, there’s a point in any journey when the motivation really hits and you know it’s time to kick the afterburners on. I think I hit that point this week. As I said before, this week was epic in terms of social obligations. Last Thursday I had the football game to watch for business reasons. No, really. A side business of mine relies heavily on the goings-on in the NFL. No, it’s not gambling related. In any case, that day was spent at work, followed by a solid gym session, and finished off with the game and a healthy dinner comprised of some chicken and black beans. Delicious! The problem, as it often is with me, is the booze. 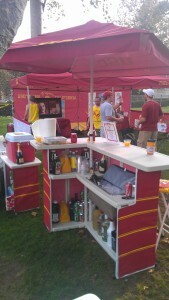 Our tailgating crew is aptly named the “Booze Brothers” (complete with tank tops) and we start early. I arrived late on Saturday morning, having overslept. To be clear, “arriving late” means I showed up at 7:30 AM. I finished assisting with the setup and by 8:00 we started in on the mimosas. 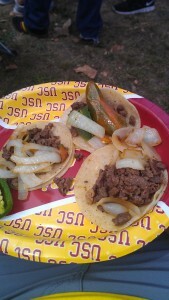 Then some beers, some cocktails, some snacks, some tacos, etc. I’ve always found it important to have one solid cheat session during the week in order to both kickstart the ol’ metabolism but also keep you sane as well. Saturday was a beast of a cheat day for me. Luckily I made it home mid-afternoon and did little other than nap the rest of the day. Sunday was NFL day and, despite my Broncos losing to Houston, it was a pretty good day. We started the day with omelets made with ham, green pepper, and onion with some black beans on the side. Coffee and water were the beverages of choice until afternoon hit and I had a few beers. A pizza happened to arrive for the night game but I didn’t eat much of it so it was still a fairly solid day. It was a thin crust! Monday brought the routine back to normal, with work being followed by a hearty session at the gym. I was supposed to attend an event that night but decided to take the evening off, figuring having some clean clothes for the rest of the week would be preferable to a GQ party with food and an open bar. I feel that was wise. I had a bit of crab salad for dinner as well, which was delightful. 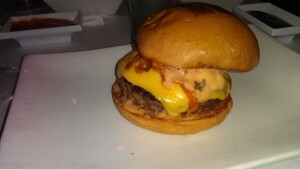 If there’s an Umami burger anywhere near you, have the spicy beef burger and the cheesy tots. My good lord those are good. Unfortunately, it came the night before my weigh-in so I knew the metrics would be thrown off. Still, a deal is a deal and if you think I’m going to pass up having dinner with three ladies you are sorely mistaken. The gym routine is an ever-changing beast. Lately I have been finding it difficult to stay motivated. It’s not that i don’t want to go to the gym but, rather, that the routine has become so repetitive that I find it difficult to enjoy it much these days. We had a discussion Tuesday about that very fact and it seems it will switch up again. I think cardio is the way I need to be leaning for this because it’s what worked the first time. More to come on what we decide but, for now, it’s in trial/experimentation mode. So now we get to the meat of it, the ever-exciting weigh in. I felt good about today, even if I had consumed that heavenly Umami burger last night. It turns out I was right in feeling that way, having dropped another two pounds. I feel like I’m getting my mojo back and, if Austin Powers has taught me anything, it’s that mojo is everything. Fight on, my friends, and I’ll see you next week. Born in Wichita but seasoned in Hollywood. I have a good heart and I'm always kind, but I still have an edge. I'm smart, but I'm not a complicated guy. My interests are many and varied, but when you get right down to it, I love life and I love my family and friends. That's the core of who I am.